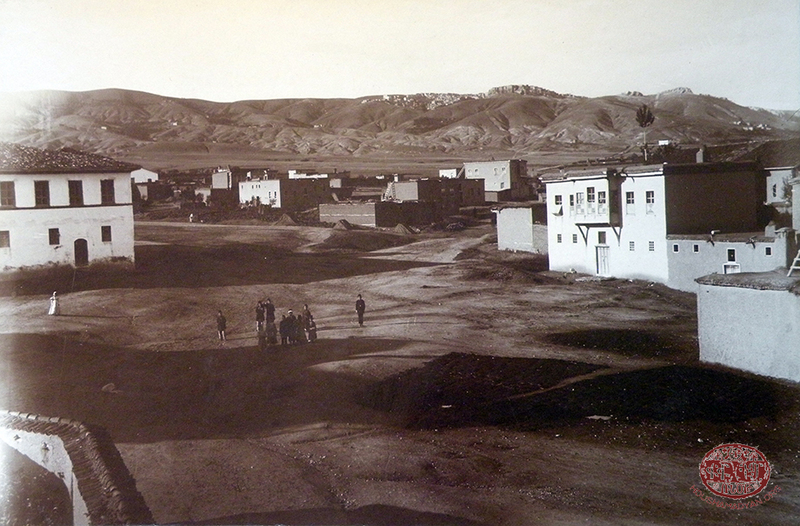 The vilayet of Mamuret-ül-Aziz consists of vast, fecund valleys between the Taurus and Anti-Taurus mountain ranges. The Euphrates and Aradzani (Eastern Euphrates, or Murad river) rivers pass through it. In general, the climate is dry and beneficial to health, with sufficient, light humidity. All four seasons of the year are prominent, hence the flora and fauna are diverse and abundant. The plains are lush, but the mountains are bare; only at their base do they have vegetation cover, in the form of almond orchards and vineyards. The advantageous soil, water, and climate conditions have resulted in advanced levels of cultivation and production, sufficient both to meet the needs of the region's population and to use in commerce, for export. The main occupation and income source of the population of the plains is agriculture, as well as essential domestic crafts and small business, whereas the occupations of the inhabitants of cities are manufacturing, crafts, and commerce. The region's Kurds are the sheep herders and main procurers of meat. The following are cultivated: a wide variety and copious quantities of legumes (lentil, bean, chickpea, fava bean, millet, pea, etc. ), grains (wheat, corn/maize, barley), cotton, tobacco, oil-producing plants and seeds (linseed, sesame, black seed [nigella sativa]), fruit orchards (apricot, mulberry, plum, peach, pomegranate, quince, apple, pear, walnut, cherry, sour cherry, melon, watermelon, etc. 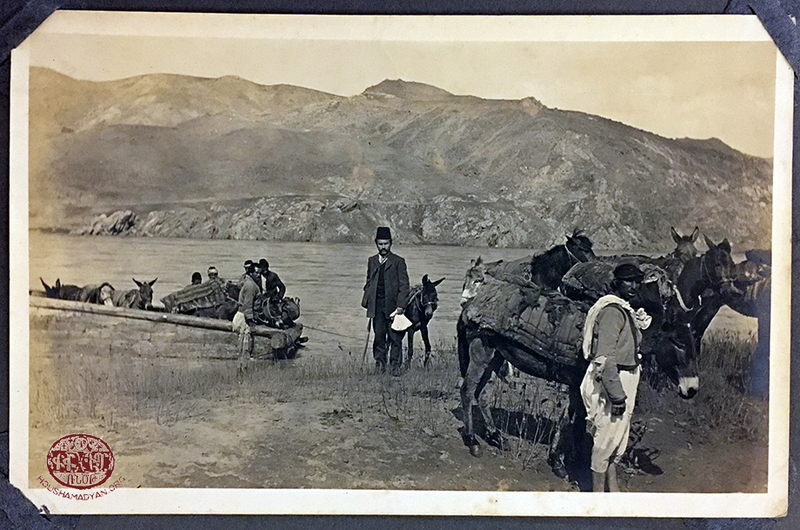 ), mulberry groves (which are abundant, for purposes of sericulture [silkworm farming] and silk production), almond groves, various vegetables (eggplant/auburgine, squash, potato, onion, garlic, okra, pepper, green bean, tomato, turnip, beet, carrot, cabbage), greens and herbs (basil, parsley, mint), etc. Wild plants are widely known and used both for sustenance and for medicinal purposes (purslane, goatsbeard/salsify [Tragopogon], alfalfa/medick/clover [Trifolium], artichoke thistle [Cardoon], cress, celery, foxtail lilies [Eremerus], peppermint, orach/mountain spinach). In season, the sweet-tasting natural comestible called kazbe (manna) is gathered from trees in the forests. The cultivation of grapes is the main occupation for certain villages. Many types of grapes are grown, such as "goat's teat," "sunflavor," "crunchy," "donkey grape," "lorig," "poplar," "plumlike," "partridge beak," "ox eye," "mini-sugar," "bride's finger," "muskroot," etc. They are cultivated for various purposes—for the table, for winter, for molasses, raisin, wine, etc. The production of wine is highly developed. A certain period after the grapevines have flowered and the fruit has set, they trim unripe fruit (azokh) to use as a tart food additive. The remaining grapes on the vine begin to sweeten, described as "descent of the mark"—i.e., the mark of ripeness and sweetening. The actual grape harvest (aykegoutk), however, begins after the Feast of Dormition [a Marian feast, celebrated by the Armenian Apostolic Church in August]. (In the dialect of Kharpert, the definition of the verb gtel ["to milk" in standard Armenian] is the squeezing of juice from grapes [the gout in aykegoutk refers to gtel].) Families and friends gather in the vineyards, working tirelessly as well turning the harvest occasion into holiday celebrations. A portion of the harvested grape is brought home, where, in the courtyard, they prepare molasses or wine by straining the grape must [the freshly pressed juice that contains the skins, seeds, and stems of the fruit]; another portion is taken to the city to be sold, or it's delivered to the winemaker. Mulberry, aside from being used when fresh, is also dried; a portion of the dried fruit is converted to pokhintaliur [ground into a powdery flour-like substance] for use in the making of sweets. They also prepare molasses and fruit leather with mulberry. And a portion of the harvest is used to distill oghi [a liquor (raki, arak)]. Beekeeping is a common and lucrative occupation. The apiarists make hives out of mud, and the honey is so abundant that there's very little need for the use of sugar. Moreover, instead of sugar they use the grape and mulberry molasses they've prepared in the summer. Sugar is uncommon and is found only among the wealthy. They raise domesticated animals, including sheep, goats, cows, oxen, also horses and donkeys, and of course chickens. The meat trade is highly developed; outside the city is an abattoir, where the animals are slaughtered and then provided to the butchers, who always have fresh meat to sell. Some villages are able to also support themselves by fishing. 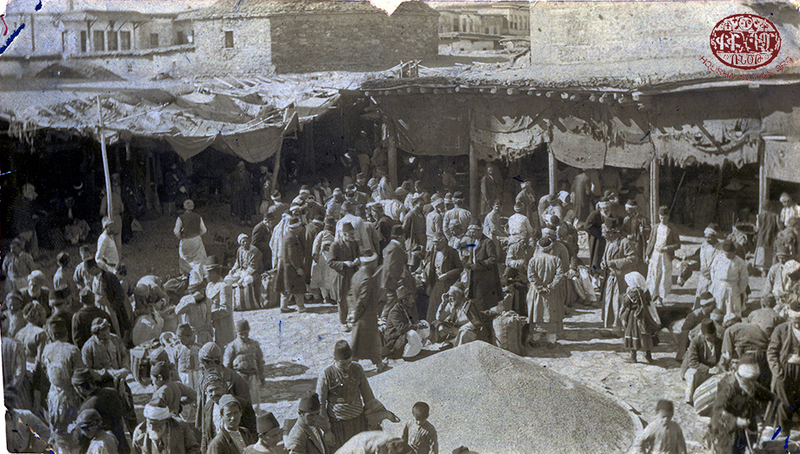 In the markets there are grocers who sell all manner of comestibles, including fresh vegetables and fruit. There are also makers of roasted chickpeas [sometimes seasoned with salt, hot spices, and dried cloves, or candy-coated] and candymakers. The presence of millers eases the arduous process of converting wheat into flour and bulgur. 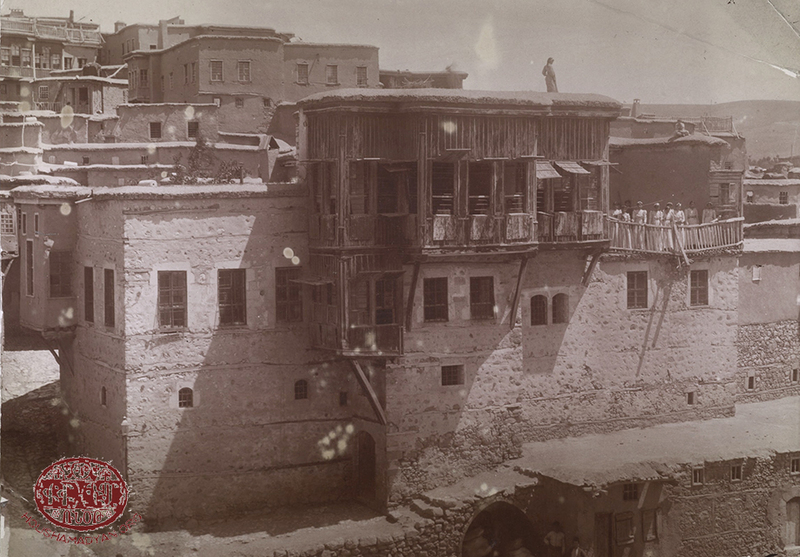 There are also stone mills (bezerkhana) in the city; their stone wheels turn with the help of mules to prepare bulgur and cracked wheat. In addition, each home has its own hand-operated millstones, two circular stones atop each other, which are used to grind wheat and make cracked wheat. 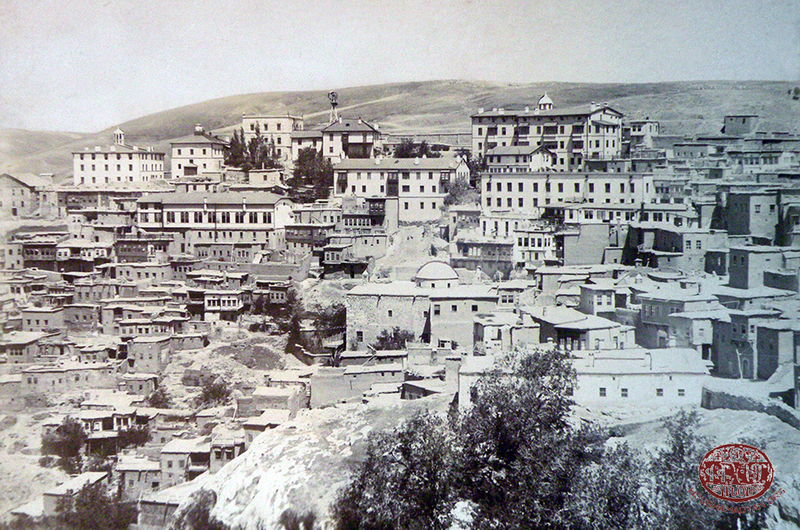 The vilayet is characterized by an abundance of domestic crafts and trades; for example, thanks to tinsmiths and coppersmiths, they have a wide variety of spoons, ladles, knives, cups, salvers, water pots, gugums [güğüm: kettle or jug for carrying water, liquids], trays, pots, frying pans, vats, etc. There are also master potters who dig up red clay from nearby hills and fire their work in kilns; they make a host of objects for daily domestic use, such as cups, plates, crockery, earthen kettles (poghogh), large and small casks, etc. 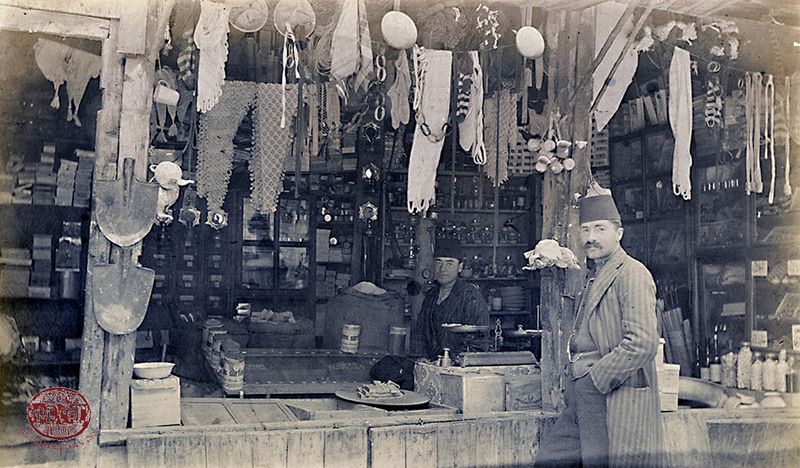 Other necessities are imported by merchants: cloth, textiles, thread, citrus fruits, sweets, and soap from Aleppo; fine/silk cloth from Diyarbekir; dried fruits from Malatya; petrol from the Caucasus; meat animals, hides, ghee, and butter from Dersim. Houses are built of earth or wood. The primary room of every house is the soufa, the sitting room, where the household gathers to spend most of the day. The kitchen is called the "firehouse," where the cooking stove is, in the shape and height of a table, in which they burn wood and gshgour [dried cow dung]; the kitchen utensils are arranged in the in-wall cupboards. They have a separate room called the "flourhouse," where flour is kept. The storeroom, in the cellar, is accessed through a narrow passageway from within the house; there, they keep all the household provisions: dried fruit and vegetables, tallow [rendered beef or mutton fat], khavourma [braised meat browned and stored in its own fat], sweets, bulgur and grains, legumes and seeds, cheese, pickles, etc. Nearly every house has its own "ovenhouse," with a tandoor dug into the earth, its walls reinforced with a distinct clay that's fired. The homemade bread is thin, flat, and round (with a diameter of 40-50 centimeters [roughly 16-20 inches]), baked thoroughly, with the surface toasted; they make enough for a few months and store it in the ovenhouse. They use the bread as is, dry, or soft, after moistening it with water. 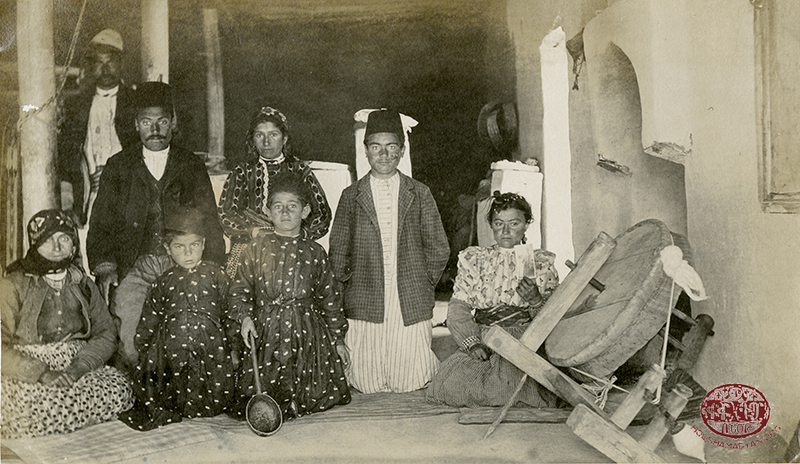 Each family makes its own "house bread"; aside from the traditional common bread there are various other types, such as lavash, which they call loshig sometimes; saj hats, a thin bread baked on a saj; blig, a thick, round little bread baked in the tandoor; kata, with oil, is a holiday/feast bread, while losh is kata without oil. There is also the fragrant bread type, called touyri hats [tandoor bread], with sesame paste and black seeds on top. 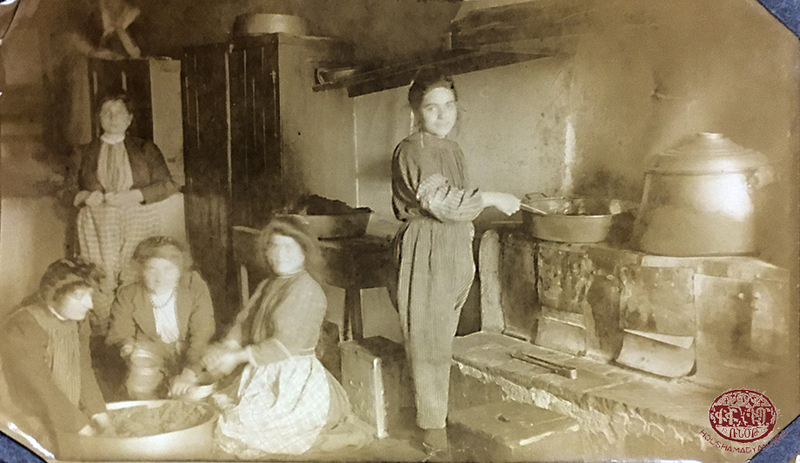 Nevertheless, bread-baking is a common profession, and professional bakers prepare "market breads": somoun [somun, a round and puffy bread], franjala [francala, (French bread) a thin, long loaf made of finer flour], drnagh ekmegi [tırnak ekmeği ("fingernail bread"): the baker presses down on and marks the dough with his fingertips], etc. For consumption, they plant and extract oil from flax/linseed and sesame. Dairy products are not abundant, but each family produces, within its capabilities, its own tanoutsan [dairy products]: e.g., cheese, curds, yogurt, butter, kher [skin that forms on boiled milk: lactoderm], gatiman [raw lactoderm]. For winter, they prepare artar yegh [clarified butter, or ghee], chortan [pressed, dried yogurt, milk solids, and curds], tarkhana [fermented and/or dehydrated yogurt or curds combined with egg and flour or bulgur]; and they stockpile cheese and curds. With the chortan they prepare various soups: The small balls of chortan are presoaked in sufficiently warm water, and when they begin to soften they are mashed and stirred until they assume a liquid consistency; after being boiled, the liquid is used in food preparation. 1. Add seasonings to the meat, work in the breadcrumbs and egg, and make acorn-sized meatballs. 2. Fry the meatballs and remove from the pan. 3. In the same pan, make an omelet. 4. Mash the garlic and mix it with the yogurt. 5. Arranged the meatballs on the omelet, add the yogurt and onion mixture on top, and serve. Usually, they prepare this dish while baking homemade bread. Dip the lavash in garlic-yogurt, and arrange it on a plate; melt the ghee and drizzle it on top; serve. 1. Stir in the flour and egg into the yogurt, bring the mixture to a boil, and mash the garlic into it. 2. Slice the onion, stir-fry it with the ghavourma, and add seasonings to taste. 3. Serve with dried lavash chips on the side. 4. To eat, fill a plate with lavash chips, add the meat, then the cooked garlic-yogurt on top. Grill the eggplant over fire, clean it, chop it up, and place in the plate; add garlic-yogurt on top, then top with the sautéed meat. Fry the meat in its own fat, then stir in the tomato and pepper paste. Grill the eggplant, clean it, mash it, mix in the chopped parsley, and place in the plate; add the meat in the center of the plate and serve. 1. To the chopped and sautéed onions add diced carrots and sliced leeks, place in covered pot, and steam. 2. Add the rice and 2 demitasses of water, add spices, and cook over low heat. 3. Beat the egg and the juice of the lemon together, add the mixture to the pot, bring the contents to a boil once, then serve. Mix the ingredients, and stuff the intestines (which should be washed, then left in lemon or vinegar water for an entire day so that any smell is eliminated); tie off the intestines every 10 centimeters, place in a pot, then boil. Serve hot, also after frying, if desired. 1. Chop the onions and mix with the meat; add egg, spices, breadcrumbs, then knead. 2. Shape into 5-centimeter round patties, arrange on a grill, and bake in oven or grill over fire. Chop the in-shell fava beans; boil them, and drain. Into the sautéed onions add the beans, paste, and spices, and cook. Serve with garlic-yogurt. They also cook broad beans with ghavourma: Sauté the meat along with the onions, then continue as previously described. Serve with rice pilaf. 1. Split the eggplants and insert spiced garlic cloves, then fry. 2. Arrange the eggplants in a pot, top with slices of tomato, onion, and pepper, add spices, and cook in covered pot over low heat. Boil the beans, add chopped vegetables, paste, and seasonings. Allow to cool. Top with chopped fresh green onions and parsley, oil, and lemon. 1. Slice the vegetables, arrange in a pot, and top with oil. 2. Arrange chopped-up fish on the vegetables, close cover, and over low heat let it steam-boil in its own liquids until the liquid dissipates. 1. Cook the meat along with sautéed onions, add the rice and seasonings and continue sautéing a little; add the pine nuts, water, and chopped greens, and cook over low heat until the water is fully absorbed. 2. Split the lung (or neck, liver, or spleen), fill with the cooked mixture, and sew shut. 3. Fry on all sides, then add to a pot filled with water, and cook over low heat for a long time. This is a dish similar to Khapourgha. Stuff the boiled and spiced cracked wheat into the rib cavity of the lamb, sew it shut, and fry on all sides until browned. Then steam-boil it with a small amount of water and the fat derived from frying. This dish is usually prepared in the fall, during the Feast of the Exultation of the Holy Cross, during open-air pilgrimages. Parboil the meat with a little water; add sliced vegetables and continue to cook until both the meat and the vegetables are cooked. Cook the chopped onions with the ghavourma in its own fat; add chopped orach, rice, and paste, a little water, and the seasonings, and continue cooking. Serve with garlic-yogurt. Aghousag is the term for whole goat that's boiled and then browned, and taken as a gift to a wedding. Khash is prepared with sheep trotters and head. First singe the trotters and head over fire, then clean them; bring to a boil once, and discard the water. Place in a large pot or cauldron; insert bay leaves and whole allspice and peppercorn among the various pieces, fill with an abundant amount of water, and cook 5-6 hours. Serve with mashed garlic, lemon, and dry lavash on the side. Boil the wheat and the bone together; as it cooks, add the paste and seasonings. For the chortan substitute, mix the yogurt with egg and flour and bring to a boil. Boil the cracked wheat and the onion together, then over it pour the combined mashed garlic and heated yogurt mixture; bring to a boil and serve hot. When there's old, stale bread in the house, the woman of the house prepares this soup to use up the old bread. Chop the onion and sauté it along with the ghavourma meat; add spices and water, and bring to a boil; beat the egg and quickly stir it onto the boiling liquid. Crumble the bread into the soup and eat. Usually prepared during Lent using dried vegetables stored in the cellar, and with squash/pumpkin and melon seeds as oil-bearing seeds. Ground the squash and melon seeds after having soaked them; boil them in a small amount of water; with a sieve, remove the bits of shell that rise to the surface of the water. Add the seasonings to the liquid, and cook the chopped vegetables [and beans] in it. An unmatched and easy summertime dish, especially suitable during days working in the fields. Boil the cracked wheat and chickpeas; after they cool, add the yogurt; garnish with the mint and serve. This version of pancharabour is usually prepared during wash days. Boil the cracked wheat; add the chopped chard, then stir in the red pepper heated in the fat; bring to a boil and serve. 1. Boil the legumes and grains in abundant water. 2. Add the red pepper, chopped chard, and seasonings. 3. Chop the oil, blanch in oil, and mix into the soup. 4. When serving, add mashed garlic if that's a preference. * It's possible to substitute beet-greens, spinach, or purslane for chard. Slice the onions in rings and boil together with the rice (or bulgur) and lentils; add the chopped chard. Stir in the red pepper that's been heated in the ghee, and bring to a boil. Boil the lentils then add chopped garlic and bulgur; when that soup is ready, whip the tahini diluted with water and drizzle it over the soup. Chop the onions and wilt/blanch them in oil; add the seasonings and the chopped tomatoes and parsley, and cook; stir in the boiled cracked wheat and add water in a sufficient amount to make a thick-consistency soup. Cut potatoes, chop onions, and boil them; add the bulgur and seasonings, and continue to boil. When the soup is ready, drizzle water-diluted tahini over it. Boil the cracked wheat, add the chopped purslane, then add the sautéed onions that have been combined with the seasonings; bring to a boil and serve. Mix and knead the dough ingredients, let the dough rest for an hour, then roll it out with a rolling pin; cut it into strips and sprinkle flour on top. Boil the lentils, add the pasta, and continue to cook. Dilute the tahini with the soup liquid, and combine it with mashed garlic and seasonings; add the mixture to the broth, bring it to a boil, then serve. Boil all the ingredients together, without stirring. If desired, place a whole onion in it. Tarkhanabour: Presoak the tarkhana [fermented and/or dehydrated yogurt or curds combined with egg and flour or bulgur] sıkhıms [the pieces formed by squeezing the mixture in one's palm]; after boiling them, add sautéed onions; season with ground red pepper and mint. Tıtabour [tart soup]: A tart soup especially for Maundy Thursday, made with the tart-tasting chard-like sorrel [spinach dock or narrow-leaved dock]. Prepared by adding onion, garlic, hot red pepper, vinegar, and bulgur to the boiled sorrel. Sauté the ghavourma in its own fat, and season; add bulgur and water, and cook over medium heat until the water is entirely absorbed. Boil the cracked wheat; heat the red pepper in ghee and add both to the wheat; serve. Pilaf with shirig [sesame oil] is prepared like cracked wheat pilaf, except instead of ghee they use tahini during Lent. Pilaf with teveg ["leaves and stems"] is prepared with grape leaves and course bulgur. Pilaf with shehre ["pasta"] is prepared by browning thin pasta in ghee, then adding coarse bulgur and water. Pilaf with khdoud [a small type of fish] is prepared by cooking the fish with bulgur pilaf. It's customary to grind and dry the fish as a winter provision. Khorou is a dish characteristic of Kharpert cuisine. The word is derived from the verb khorovel (to roast, broil, or grill), but it refers to dishes cooked in pots placed in tandoor ovens. Soak the cracked wheat for a few hours in hot water. Toast the sesame and grind it; slice the onions; combine all the ingredients, along with double their volume of water, in a pot; cook for an extended period on low heat, without removing the lid, until the water is completely absorbed. Soak the cracked wheat in very hot water for a few hours. Toast and grind the sesame. Cut the onions and pumpkin into large pieces. Combine all the ingredients in a pot, fill with water, and cook over low heat. Prepared with khdoud fish, in the tandoor, by arranging the fish, onions, potatoes, and the vegetable called Aghvezeroug (a wild celery) that grows along the banks of streams. 1. Chop the onions, place in a strainer, add salt, and let the liquid drain; combine with ground sesame, chopped walnuts, chopped greens, and seasonings. 2. Combine the shell ingredients, add water, and knead; form into walnut-sized balls. 3. Flatten each ball of dough, add filling on top, form a shell around it, and boil in salted water. 1. Chop the chard, bring to a boil, and drain. 2. Chop the onions, lightly boil in salted water, and drain. 3. Combine ground sesame, chard, onion, chopped greens, and seasonings. 4. Combine the shell ingredients, add water, and knead; form into walnut-sized balls. 5. Flatten each ball of dough, add filling on top, form a shell around it, and boil in salted water. 1. Combine the tahini, chopped walnuts, and seasonings with the sautéed onions. 2. Grind the chickpeas, combine with the remaining shell ingredients, add water, and knead; form into walnut-sized balls. 1. Prepare the filling by cooking the meat and chopped onion. 2. Combine the shell ingredients, add water, and knead; form into balls. 3. Flatten out each ball, add the filling, form walnut-sized koftas, and boil in salted water to which tomato paste has been added. 4. Serve with or without the broth. Prepared and served the same as porov köfte, except that the koftas are a little larger and more pyramidal in shape. Dissolve the paste in water, and add that liquid to the fine bulgur. Finely chop the onions, add to the meat along with the seasonings, and knead; then combine the bulgur with the mixture. Wetting one's fingers in water, form walnut-sized balls and place the balls in boiling salted water. Dissolve the paste in water and add the liquid to the fine bulgur. Finely chop the onions, add to the meat together with the seasonings, and knead; then combine the bulgur with the mixture. 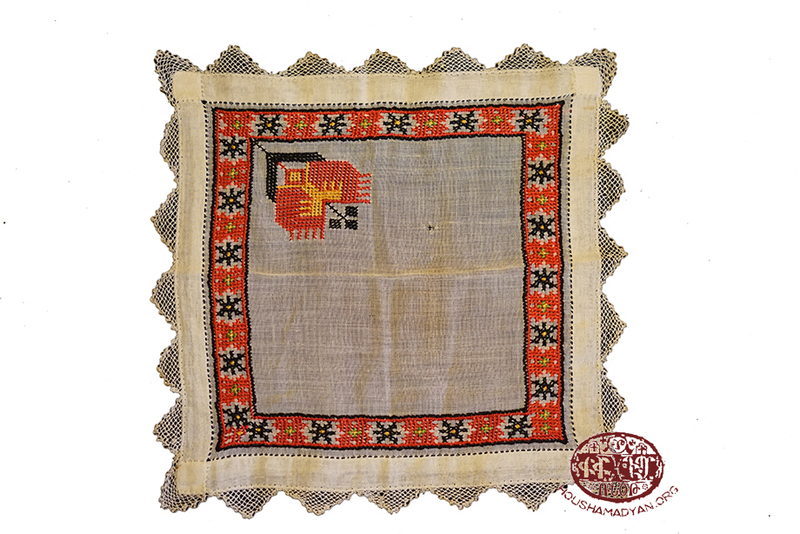 Adding oil to one's fingers, prepare the sıkhıms (the pieces formed by squeezing the mixture in one's palm). As desired, mix the chopped green onions and parsley into the mixture or sprinkle on top as garnish. Dissolve the paste in water, and add the liquid to the fine bulgur. Finely chop the onions, add to the meat together with the seasonings, and knead; then combine the bulgur with the mixture. Wetting one's fingers in water, form round patties; dip each one in beaten eggs, and fry in the ghee or oil. If desired, garnish with chopped parsley. Chop the broth meat into small pieces and boil with the chickpeas. Mix the glorjig ingredients, knead the mixture, and form into acorn-sized balls. Add the tomato and pepper paste to the meat and broth, and continue to boil after adding the meatballs as well. When all ingredients are fully cooked, stir in the mint and lemon juice. Chop the onions, garlic, and tomato; combine with the remaining ingredients; and stuff the mixture into the hollowed-out eggplants. Arrange the eggplants in a pot and insert the mint leaves in between them; add water until it covers the dolmas, and cook. It's tradition to serve the fatty meat broth in small dishes alongside the dolma. 1. Chop the onion and parsley, combine with the meat, and add the rice, pastes, and seasonings to form the filling. 2. Stuff the filling into hollowed-out zucchini. 3. Fry in hot oil, arrange in a pot, add 1 cup water, and cook over low heat. To the sautéed onions add the remaining ingredients, mix to form the filling, and use the grape leaves to wrap around dollops of filling. Arrange the dolmas in a pot; add water sufficient to cover them; place a dish in the pot, on top of the dolmas; then cook over medium heat until all the liquid is completely absorbed. Let cool. 1. Prepare and knead the dough; let rest for 30 minutes. 2. Grate the cheese, combine it with chopped parsley, egg, and seasonings. 3. Roll out the dough thinly, cut out circular pieces, place a dollop of filling on top of each, then fold the dough over the filling and seal [press or crimp the edges shut]. 4. Place in freezer for one hour. 5. Fry in hot oil. 1. Knead the dough, cover to keep warm, let rest for two hours so that it rises. 2. Grate the cheese, combine with chopped parsley, the eggs, and red pepper. 3. Roll out the dough into oval shapes, on top of which add the cheese; fold over the dough and seal into a semicircular shape, then bake. 2. Shred the meat, combine with chopped onion, eggs, and seasonings. 3. Roll out the dough into spherical shapes, spread the filling on top, fold the dough over and seal; brush on egg wash, and bake. Dilute the strained yogurt with the half cup of water, and mix into it chopped cucumber, mashed garlic, and seasonings. This appetizer is usually prepared during Lent. Boil the chopped chard and drain. Dilute the tahini with water and combine it with the remaining ingredients, then pour the mixture over the chard. *Spinach or beet greens can be substituted for chard. Cube or chop the squash (zucchini) and boil it lightly; after it cools, combine with the yogurt, mashed garlic, and seasonings. 1. Boil the chopped orach and drain. 2. Panfry the orach along with sautéed onions, season, and combine with the beaten eggs. Usually prepared the day after dolma is made, using the scooped-out portions of the eggplant or summer squash. Chop the onions, sauté them in the meat and fat, add the seasonings and chopped vegetables, over which—once the vegetables are cooked—break the eggs. Tsvadzegh [fried eggs or omelet]: Prepared by pouring beaten eggs onto hot oil. Agnig ["little eye"]: Fried egg prepared without beating the eggs; the egg is fried whole, in hot oil. Hatsprton ["bread chunks"]: Prepared by dipping pieces of old bread in egg and then frying them in oil. Jmour ["crumple, mash"]: Usually prepared when removing hot bread from the tandoor, tearing off small chunks, then mashing or crumpling them in a little oil. Some add grated cheese on top. There is also the por pilav jmour: morsels of bread fried in oil, topped with yogurt or molasses. Aghındzıgoud ["toasted seed"]: Prepared by toasting and salting squash, melon, and watermelon seeds, along with chickpeas and cracked wheat; it's a hospitality staple during winter feasts and holidays. Bring the water and sugar to a boil while stirring. Brown the flour in butter, and to that roux add shredded cheese, continually stirring until a homogeneous mixture is formed. Slowly add the sugar syrup, continuing to stir. Either press flat onto a plate or form into little balls, sprinkling the desired spice on top. Dilute the tahini in warm water; dip the lavash loaves into the liquid and stack atop each other, sprinkling each layer with the mixture of walnuts, sugar, and cinnamon. Allow to soften, cut into pieces, and serve. Knead the dough, and form into walnut-sized balls. Roll out the dough, brush with butter, sprinkle the filling on top; then roll up the same dough around the thin rolling pin, gather the dough unto itself [push in from both ends], creating folds in the cylindrical dough; slide off the rolling pin and arrange in a baking pan. Bake in a medium oven until the pastry reaches a golden color. Remove from oven and pour cold sugar syrup over it. Boil and mash the potatoes, combine with the flour and dough starter, and knead into a soft dough; let rise. Prepare the syrup by combining and boiling its ingredients. When the dough is ready, use spoons dipped in water to spoon out pieces of the dough, form into balls, and fry in hot oil. When the lokmas are browned, remove from the oil and dip them for a few minutes in cold sugar syrup; remove the lokmas and place in a strainer to drain the extra syrup. Add the yogurt and dough starter to the flour and knead into a soft dough; let rest. Prepare the syrup by combining and boiling its ingredients. When the dough is ready, use spoons dipped in water to spoon out pieces of the dough, form into balls, and fry in hot oil. When the balls turn brown, remove from the oil and dip them for a few minutes in cold sugar syrup; remove the balls and place in a strainer to drain the extra syrup. Dissolve the flour in cold water, add the molasses, then bring to a boil; pour into small bowls and serve. If desired, sprinkle ground cinnamon and walnuts on top. Prepared the same way as malez, but more watery; sometimes, salt is also added. Peel and slice the quince; lightly panfry, then arrange in another pan; add the sugar and water to the pan, and cook until the quince is soft. Serve warm. Boil the cracked wheat, combine with the molasses and butter, place into small plates, and garnish with chopped walnuts. During Lent, it's prepared without butter. Boil the cracked wheat, add chopped dried fruits, and continue to cook until it thickens. Combine with the molasses, bring to a boil, then let cool. Place the nuts, dried fruits, and raisins into a pot, and add boiling water sufficient to cover them. Place the lid on the pot, cover in warm cloths, and allow to soak for 5-6 hours. Sprinkle ground cinnamon on top. Adzig is prepared usually during Lent by sprouting wheat, then grinding and cooking it; it's an appetizing, sweet food. Khavintz is prepared for expecting or nursing mothers, to ensure abundant milk flow. Make roux by toasting flour in oil, then add hot water while stirring continually until a homogenous mixture is formed. Add molasses, if desired. Pegegh is a New Year's dish. Prepared with the dough of regular bread, formed into various shapes: braids, ovals, people-shaped dolls, etc. Water is brushed on the shaped dough, which is then topped with sesame seeds; after it's baked, as it's being removed from the oven, molasses is brushed on it to sweeten it. Pajoug is a cake of flour and butter. Raisins and walnuts can be added into the batter, if desired; honey or molasses is drizzled on top. Gatnabour ["milk soup"] is prepared during holidays/feasts by cooking rice in milk; some make it sweet, others add salt. Tel-tel anoush ["stringy sweet"] is prepared during holidays/feasts. Watery batter is dripped on a saj to create strings of dough; after they're cooled, they're mixed with butter and stuffed with walnuts, then rolled up and baked until golden brown. After being removed from the oven, they're topped with honey-water. Khatmar is a holiday sweet consisting of toasted little breads mixed with honey and lactoderm. Artar yegh is clarified butter, or ghee, which they prepare by agitating fatty yogurt in a churn until the butter rises to the surface of the remaining yogurty liquid [tan] and forms clumps. From those clumps, they form balls of butter in the palm of the hand and preserve them in the same yogurt liquid, after salting the liquid. But that butter cannot be preserved for too long; accordingly, they melt it over low heat, and when the water in the butter is boiled off, it begins to clarify and turn transparent; that fatty substance is artar yegh—ghee. Tankam ["strained tan"] is prepared by boiling and straining the yogurty liquid left over from butter preparation; the dish made with the tankam is called tankhash ["tan boil"]. Shor or lor [curds] is prepared by bringing yogurty liquid to a boil and curdling it; the curds constitute the main ingredient of horadz banir ["buried cheese"—made with a variety of herbs, sealed in a clay pot, and buried in ashes or earth]. Chortan ["dry tan"] is prepared by straining yogurt, then mixing it with a little flour, and carefully boiling it. Forming small balls with the mixture, they dry the balls under searing summer sun. In its wet state, chortan is called torakh. Tarkhana is prepared by first boiling cracked wheat; they then cook the yogurt, constantly stirring it so that it doesn't curdle. They combine the two [wheat and yogurt] and boil the mixture until it thickens. After it cools, they make the sıkhıms and dry them under the searing sun. For the Lenten period, they prepare tarkhana with water. Shire tarkhana is prepared by first boiling cracked wheat, then combining it with grape molasses and boiling the mixture until it thickens. After it cools, they form sıkhıms and dry them under searing sun. Kher is lactoderm that, in the summer, when it's abundant, they skim off and cook with a little flour or starch, then dry under the sun. Ghavourma is prepared with extra lean red meat. Salt the meat, leave it in a strainer for a day so that the bloody liquid drains out. Then boil the meat in a pot along with one quince. When the meat is ready, remove the lid and boil until the water boils away. Chop the tail fat of sheep into small, chickpea-sized pieces; melt them, and remove the khrkhzin (toughened, rice-sized solids), then pour the fat over the meat and fry together. To store, fill the meat into wide-mouthed glass jars and pour the melted fat on top. 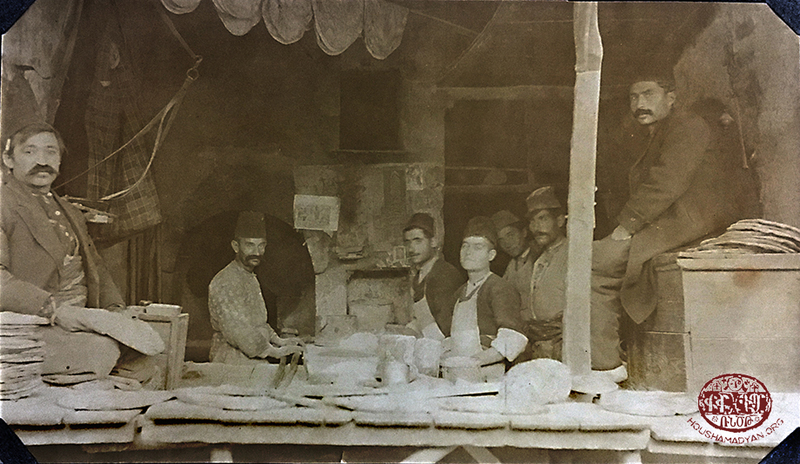 Gzhodin, or gedin, is the name of Kharpert's cured meat (pastirma), which they prepare as follows: First, they dust red, lean meat with an abundant amount of salt and place the meat in a strainer to drain the bloody liquid. They then press the meat between special-purpose stones to remove even more liquid. It's then rubbed with paste made with a bouquet of spices, and hung in a ventilated space to air-dry. Tatkhon is prepared by toasting pistachios, chickpeas, cracked wheat, and pumpkin and sunflower seeds; after grinding those, add ground red and black pepper, cumin, allspice, savory, coriander and sesame seeds, sumac, and salt. Syrup preparation: First boil fishne [vişne] [sour cherries] in water, then strain to separate the seeds and skin; pour the liquid into a tub and heat under the searing sun, stirring occasionally, until it thickens. Rojig (sharots) ["strung in a row," as in beads] is prepared by stringing walnuts, then dipping the string into a preparation of molasses and flour paste, and then allowed to dry [forming fruit leather around the walnuts]. Molasses is prepared by straining grape or mulberry juice, then boiling and thickening it. Basdegh ["paste/pastille"] is prepared by cooking grape or mulberry molasses with starch and chopped walnuts. Rachal is fruit cooked and preserved in molasses. Shirig is prepared by toasting sesame, then grinding it up. Magh: sieve or strainer. Shar magh: a sieve with a fine mesh, as that used for flour. Sarad: a sieve with a coarse mesh. Manoug B. Dzeron, Parchanj Village: A Compendium [in Armenian], Boston, 1938, pages 164-167. 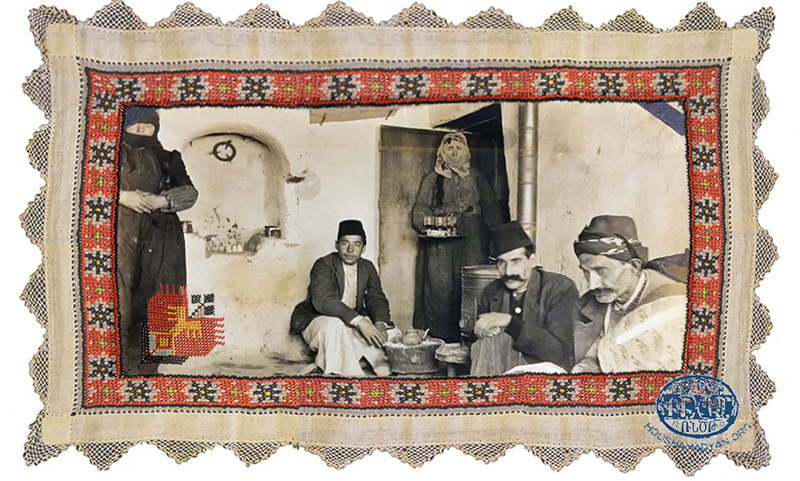 The History of Habousi Village [in Armenian], Habousi Village Patriotic Association, Boston, 1963. Hagop Gharib Shahbazian, Our Museum Village and Bloodied Crofts of Love [in Armenian], France, 1967. 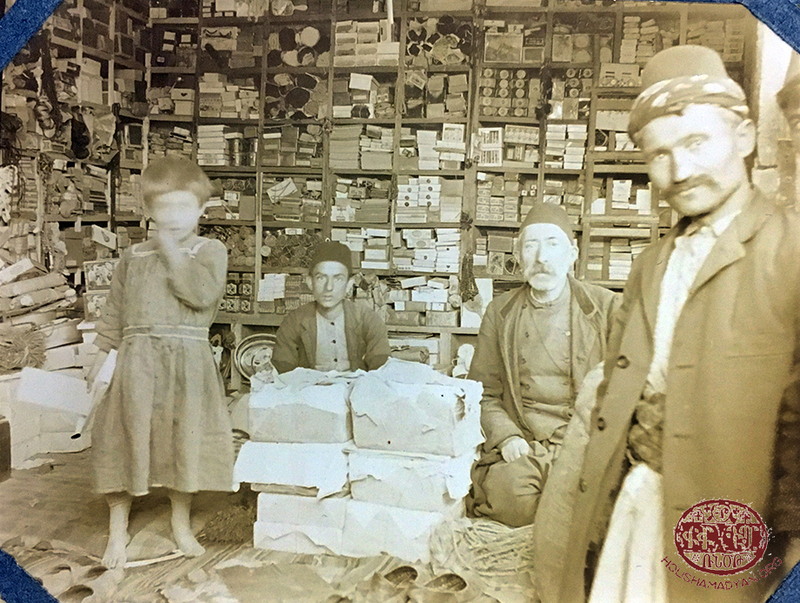 Armenian Traditional Day: Kharpert [in Armenian], Hamazkayin Beirut Branch, Beirut, 1980. 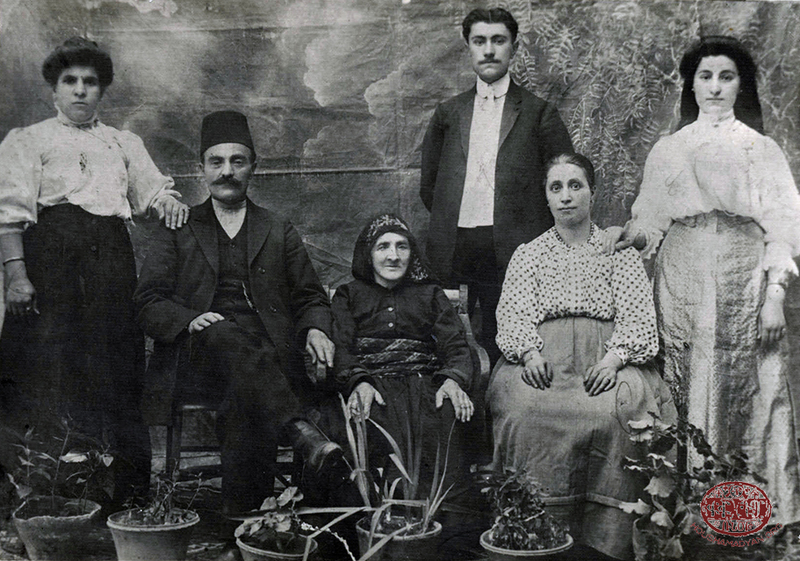 My gratitude to the Der Baghdasarian family (Yerevan), originally of Kharpert: Mr. Manoug and his sisters—Mrs. Anahid and Mrs. Azniv—who so willingly offered up the exceptional, detailed recipes of Kharpert cuisine inherited from their parents. Thanks also to Hourig Zakarian (Beirut), who provided information regarding the varieties of Kharpert foods. She collected that information with the assistance of her mother, Mari Zakarian (née Der Manouelian), and maternal aunt, Sosi Jingirian (née Der Manouelian). 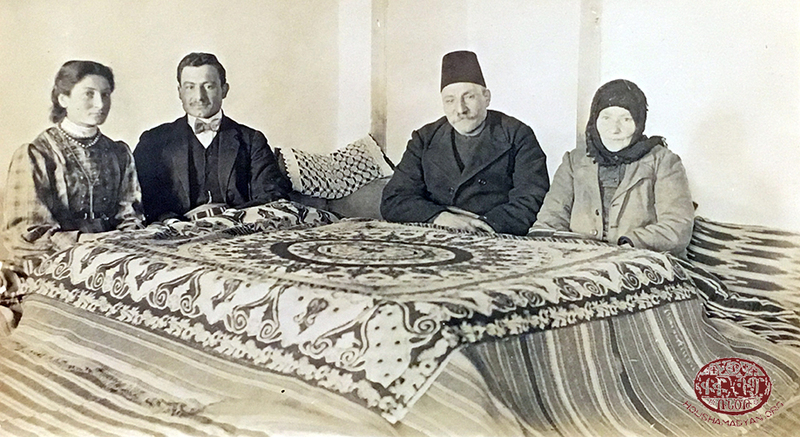 Mari's and Sosi's mother, Varter Der Manouelian (née Melkonian) is from the Agh-Mezre village of Kharpert.